New Gifts and a Giveaway! I am thrilled to announce the arrival of another fantastic line of gifts at Lollipops and Polka Dots and a giveaway to go along with it! Persnickety Pelican is a mother/daughter crafting team and their designs are amazing! My personal faves are the "Whimsical Woolies"! These little soaps are covered with soft wool and the patterns on them are unbelievably cute! All of the gifts from Persnickety are perfect for kids of all ages and adults too! You have to check out the family of Aardvarks! And just like with everything else in the boutique, all these great items are customizable! 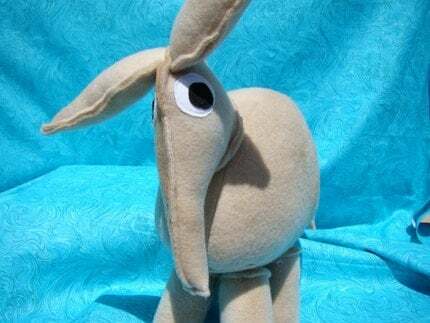 Tara and Pam over at Persnickety Pelican are so happy to be joining the Lolidots team that they want to give our readers a chance to win an Avery Aardvark toy!!! Lots of ways to enter but you've got to enter to win! Somebody is going to win...it could be you! Welcome to the boutique Persnickety Pelican!!! Tags:	"giveaway" "persnickety pelican" "aardvark" "baby gifts" "lolidots" "lollipops and polka dots" "boutique"